The real, hot advice to live as yourself! The solid consolation for those of you who are adults for the first time! 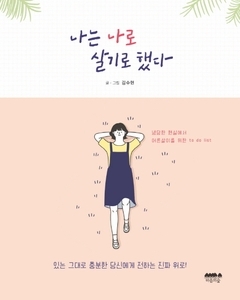 Kim Soo Hyun opens the book by saying, �When I became an adult, I realized the world is a cold place.� It was full of irrationality, everyone drew excessive lines toward each other, and even the plain enjoyed discrimination and scorn when given the chance. In a capitalist society, we were all strictly becoming those who gave and those who received. That is the world we are struggling to live in. This book tells us what we need to live sincerely as �me�. It tells you that you don�t need to feel bad after looking at some rich person�s SNS, that you don�t need to make excuses to yourself, and that you don�t need to be understood by everyone. There�s no need to work hard just because you are uneasy, and it supports you by saying not to bend down to the �right answer� that the world gives. It tells you not to be hurt by the people that go by in life, not to be shaken by someone�s words, and now to mistake something for a problem that�s only yours. It tells us what we need to hear the most: to live as yourself. This book gifts time to reflect to people who do not even have time to think about who they are. It contains what you must think and ponder about not to live like someone else, but to truly live like yourself. It is a book necessary for those who are wandering, adult-children who want to find themselves, and to everyone who are tired from working and being adults.